Roofing a flat roof can be tricky especially if it needs to withstand any kind of weather. Moisture on a flat roof doesn't run off like it does with a sloped roof, and has a tendency to work its way through the roof instead of off the roof. When redoing a flat roof it has to be water tight, and stay water tight with snow or moisture sitting on it. Coats of tar or some sort of water repellent do the job but need to be reapplied every few years to keep the protection. This is especially true if you have changing weather like heat and then cold or rain. A common flat roofing material is rubber membrane roofing. This rolled rubber doesn't absorb water and keeps its water protection for many years. Proper installation of the EPDM roofing material is crucial to the length of time the roof will last. As the rubber will repel water, the seams have to be sealed properly to keep the protection. The seal on the seams will be the first part of the roof to spring a leak too. Asphalt rolled roofing can also be used on a flat roofing project, but the seal between the rolls have to be secure to keep water from seeping in-between seams and ruining the sub-roof. With water standing on the roof for long periods of time it has more time to work its way through the roof and get to your home. This is why we all spend so much time worrying about the condition of our roof. The heat can loosen the glue on the seams and then the rain or snow can work its way through the seams. When roofing a flat roof you can use a different roofing product to cover the roof, but more attention has to be made to the seams and places water can sit and work its way through. So matter what material you decide to purchase for your roof, make sure that it is sealed properly. 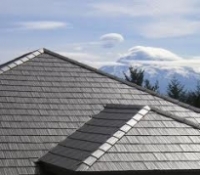 If you are using a roofing contractor make sure that he has experience with flat roofing materials.